Physiology and Ecology, Chinese Academy of Sciences. The overall interest within my laboratory is to study how plant synthesizes useful secondary metabolite in planta, the key enzymes potentially involved in these biosynthesis pathways and the mechanism of the enzymatic reactions. Currently we focus on the NAD salvage pathway (the metabolism and physiological function in planta of nicotinate and nicotinamide) in Arabidopsis and the bitter acid biosynthetic pathway in hops (Humulus lupulus). Meanwhile, we utilize high performance liquid chromatography (HPLC/MS-MS) and gas chromatography (GC/MS) to profile, compare plant metabolites at –omics level to explore the undescribed previously pathways for useful natural products in plants. 2. Wei, G., Tian, P., Zhang, F., Qin, H., Miao, H., Chen, Q., Hu, Z., Cao, L., Wang, M., Gu, X., Huang, S., Chen, M., and Wang, G.* (2016) Integrative analyses of non-targeted volatile profiling and transcriptome data provide molecular insight into VOC diversity in cucumber plants (Cucumis sativus L.). Plant Physiol. 172, 603-618. 3. Wang, C., Chen, Q., Fan, D., Li, J., Wang, G.,* and Zhang, P. * (2016) Structural analyses of short-chain prenyltransferases identify an evolutionarily conserved GFPPS clade in Brassicaceae plants. Mol Plant, 9, 195-204. 4. Li, W., Zhang, F., Chang, Y., Zhao, T., Schranz, M.E., and Wang, G.* (2015) Nicotinate O-Glucosylation is an evolutionarily metabolic trait important for seed germination under stress conditions in Arabidopsis thaliana. Plant Cell 27, 1907-1924. 5. Chen, Q., Fan, D., and Wang, G. * (2015) Heteromeric geranyl(geranyl) diphosphate synthase is involved in monoterpene biosynthesis in Arabidopsis flowers. Mol. Plant 8，1434-1437. 6. Wang, B., Chu, J., Yu, T., Xu, Q., Sun, X., Yuan, J., Xiong, G., Wang, G., Wang, Y., and Li, J. (2015). Tryptophan-independent auxin biosynthesis contributes to early embryogenesis in Arabidopsis. Proc. Natl. Acad. Sci. USA 112, 4821-4826. 7. Li H., Ban Z., Qin H., Ma L., King A.J., and Wang G.* (2015) A heteromeric membrane-bound prenyltransferase complex from Humulus lupulus catalyzes three sequential aromatic prenylations in the bitter acid pathway. Plant Physiol. 167, 650-659. 10.Wang G.* (2014) Recent progress in secondary metabolism of plant glandular trichomes. Plant Biotech. 31, 353-361. 11.Xu, F., Fang, J., Ou, S., Gao, S., Zhang, F., Du, L., Xiao, Y., Wang, H., Sun, X., Chu, J., Wang, G., and Chu, C. (2014) Variations in CYP78A1 coding region influence grain size and yield in rice. Plant Cell Enviro. 38, 800-811. 12.Song Q, Li Q, Liu Y, Zhang F, Ma B, Zhang W, Man W, Du WG, Wang G, Chen S, Zhang J. (2013) Soybean GmbZIP123 gene enhances lipid content in the seeds of transgenic Arabidopsis plants. J. Exp. Bot. 64, 4329-4341. 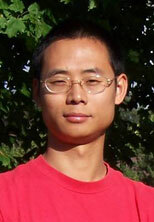 13.Zhao, N., Wang, G., Norris, A., Chen, X., and Chen, F. (2013) Studying plant secondary metabolism in the age of genomics. Crit. Rev. Plant Sci. 32, 369–382. 14.Yu, S., Cao, L., Zhou C., Zhang T., Lian, H., Sun, Y., Wu, J., Huang, J., Wang, G., and Wang J. (2013) Sugar is an endogenous cue for juvenile-to-adult phase transition in plants. eLife 2, e00269. 15.Xu, H., Zhang, F., Liu, B., Huhman, DV., Sumner, LW, Dixon, RA and Wang, G.* (2013) Characterization of the formation of branched short-chain fatty acid:CoAs for bitter acid biosynthesis in hop glandular trichomes. Mol. Plant 6, 1301–1317. 16.Yu, H., Zhang, F., Wang, G., Liu, Y., and Liu, D. (2013) Partial deficiency of isoleucine impairs root development and alters transcript levels of the genes involved in branched-chain amino acid and glucosinolate metabolism in Arabidopsis. J. Exp. Bot. 64, 599-612. 17.Yu, H., Du, X., Zhang, F., Hu, Y., Liu, S., Jiang, X., Wang, G., and Liu, D. (2012) A mutation in the E2 subunit of the mitochondrial pyruvate dehydrogenase complex in Arabidopsis reduces plant organ size and enhances the accumulation of amino acids and intermediate products of the TCA cycle. Planta 236, 387-399. 18.Liu, X., … Wang, G., … Li, C. (2012) Activation of the jasmonic acid pathway by depletion of the hydroperoxide lyase OsHPL3 reveals crosstalk between the HPL and AOS branches of the oxylipin pathway in rice. PLoS ONE 7, e50089. 19.Wu, H.J., … Wang, G.D., … Xie, Q. (2012) Insights into salt tolerance from the genome of Thellungiella salsuginea. Proc. Natl. Acad. Sci. USA 109, 12219-12224. 20.Li, C., Wang, Y., Liu, L., Hu, Y., Zhang, F., Mergen, S., Wang, G., Schl？ppi, M. R., and Chu, C. (2011) A rice plastidial nucleotide sugar epimerase is involved in galactolipid biosynthesis and improves photosynthetic efficiency. PLoS Genetics 7, e1002196. 21.Tan, H., Yang, X., Zhang, F., Zheng, X., Qu, C., Mu, J., Fu, F., Li, J., Guan, R., Zhang, H., Wang, G. and Zuo, J. (2011) Enhanced seed oil production in canola by conditional expression of brassica napus LEAFY COTYLEDON1 (BnLEC1) and LEC1-LIKE (BnL1L) in developing seeds. Plant Physiol. 156, 1577-1588. 22.Dai, X., Wang, G., Yang, DS., Tang, Y., Broun, P., Marks, MD., Sumner, LW., Dixon, RA, and Zhao PX. (2010) TrichOME: a comparative omics database for plant trichomes. Plant Physiol. 152, 44-54. 23.Wang, G., and Dixon, RA. (2009) Heterodimeric geranyl(geranyl)diphosphate synthase from hop (Humulus lupulus) and the evolution of monoterpene biosynthesis. Proc. Natl. Acad. Sci. USA. 106, 9914-9919. 24.Wang, G.., Tian, L., Aziz, N., Broun, P., Dai, X., He, J., King, A., Zhao, PX., and Dixon, RA. (2008) Terpene biosynthesis in glandular trichomes of hop. Plant Physiol. 148, 1254-1266. 25.Wang, G., and Pichersky, E. (2007) Nicotinamidase participates in the salvage pathway of NAD biosynthesis in Arabidopsis. Plant J. 49, 1020-1029. 26.Wang, G., and Chen, X. (2007) Detoxification of soil phenolic pollutants by plant secretory enzyme. In Methods in Biotechnology Vol. 23: Phytoremediation: Methods and Reviews, (Neil, W. ed. ), page 49-57. Humana Press. 27.Iijima, Y., Wang, G., Fridman, E., and Pichersky, E. (2006) Analysis of the enzymatic formation of citral in the glands of sweet basil. Arch. Biochem. Biophys. 448, 141-149. 28.Yang. Y., Varbanova, M., Ross, J., Wang, G., Cortes, D., Fridman, E., Shulaev, V., Noel, J.P.,Pichersky, E. (2005) Methylation and demethylation of plant signal molecules. In Recent Advances in Phytochemistry, Vol. 40. page 253-270. Oxford: Elsevier Science. 29.Wang, G., Li, Q., Luo, B., and Chen, X. (2004) Ex planta phytoremediation of trichlorophenol and phenolic allelochemicals via an engineered secretory laccase. Nat. Biotechnol. 22, 893-897. 30.Wang, G., and Chen, X. (2003) Laccase: properties, catalytic mechanism and applicability. Chinese Bulletin of Botany, 20, 469-475. 31.Luo, P., Wang, Y, Wang, G., Essenberg, M., and Chen, X. (2001) Molecular cloning and functional identification of (+)-delta-cadinene-8-hydroxylase, a cytochrome P450 mono-oxygenase (CYP706B1) of cotton sesquiterpene biosynthesis. Plant J. 28, 95-104. 32.Luo, P., Wang, G., and Chen, X.. (2001) Isolation and expression analysis of two cDNA encoding C4H homologues from Gossypium arboretum. Acta Botanica Sinica, 43, 77-81.